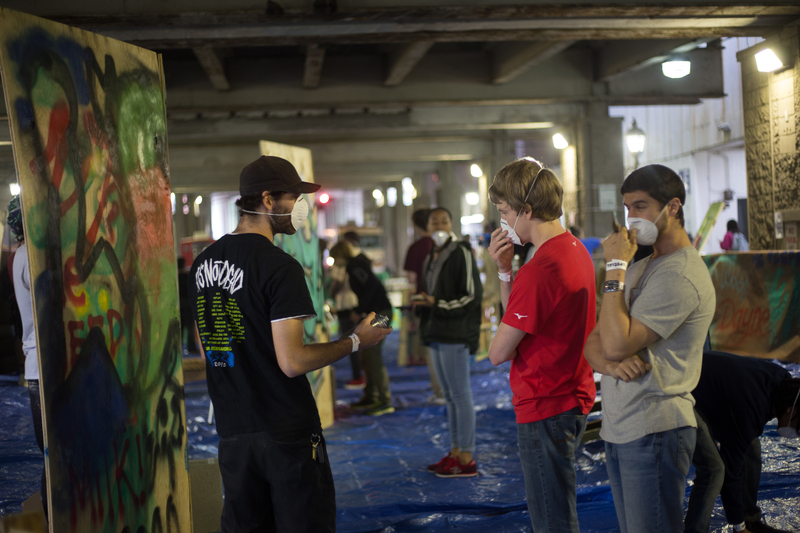 Georgia State students were allowed to spray paint doors, tires, trash cans and wooden boards, at Graffiti Jam to show appreciation for Atlanta art. The interactive Spotlight event, merged a connection between local graffiti artist and students. Art and Culture Director, Anna Boswell, was inspired to host this event after attending a similar function in October, called 787 Graffiti Ball. At the ball, Boswell met artists from all over the country, as well as a few local artists in Atlanta. The Graffiti Jam at Georgia State featured artwork from three local graffiti artists, Vane Atl, Neil and Skie. Vane Atl, has been doing graffiti art for three years. What attracted Vane towards graffiti, is the texture of brick building, and a desire to fill empty spaces. He enjoys working with vibrant orange and yellow color because the spring season brings a lot of inspiration. At a young age Neil was drawn to art, and he has been refining his skill for nearly 20 years. Neil enjoys the abstract nature of the graffiti art, meaning there are no boundaries for structure or techniques. Skie, is into fine arts, tattoos, and comic books. He says there is a difference between street art and graffiti. Graffiti artist are exposed to various forms of fine art and techniques that are combined to create a refined style. “Graffiti is like people who are artist who do it for years, and they go out and there is like a whole underground thing that ties into the elements of hip-hop,” Skie said. 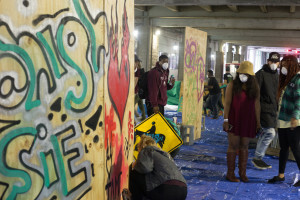 During the event artists spray painted colorful designs, murals and words on wooden boards.